The further away from modern warfare the Call of Duty series gets, the more I enjoy it. I've had enough modern warfare in my lifetime, but I'm still into pew-pew lasers and cyborgs and space. 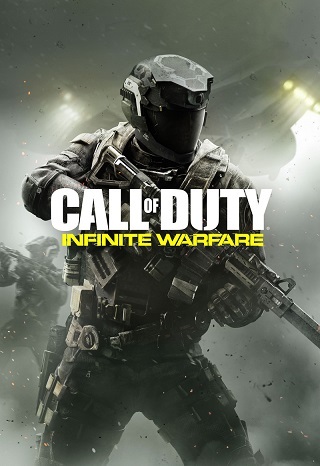 If Infinity Ward called a modern warfare game "Infinite Warfare", I would cynically roll my eyes and decline because there was a time in my life when I thought war would actually never end. Instead, in this game's context, infinite can mean more than never ending. Infinite Warfare is pure power fantasy. You are Nick Reyes, a top gun Naval special forces pilot who's also a skilled infantryman, and, shortly after the plot gets moving, in command of an enormous space battleship, along with the crew of that battleship. A Sparta-esque offworld force attacks Earth, and you're going to make them pay. Throughout the 10-ish hour single player campaign, you get the standard Call of Duty FPS experience. There are plenty of small corridors and fast paced first-person shooting that frequently centers around pushing ahead and not looking back. Infinite Warfare adds more lasers and more robots to the previous games, and the shooting still feels good. Environments are amazingly well detailed, which is a touch that fascinates. So much effort goes into making these games look real and look good for a portion of the game a lot of Call of Duty players will never play, and the rest of us will gloss over because it's another hallway on my way to shoot more bad guys. What Infinite Warfare adds to this is significant. Instead of being a strict linear progression of levels, between main story missions you can choose to take on side missions. These take two forms; boarding missions and space dogfights. A lot of Infinite Warfare takes place inside the cockpit of a Jackal, a space jet. You'll hop in the Jackal mid-mission to soften up some targets before landing and assaulting them on foot. You'll dogfight enemy Skelters in space over Earth. These aren't on-rails experiences either. You're free to maneuver as you like. There's a lot of hovery movement and plenty of assistance in the controls, but these are fun diversions from the standard Call of Duty gameplay. Where the single player campaign suffers is in the narrative. It's just a little too bland and the antagonist adds nothing. Admiral Salen Kotch is played by Kit Harrington and, knowing nothing more about him than he's in the Game of Thrones TV show, I wasn't impressed. He's no Kevin Spacey, or even a Christopher Meloni as far as Call of Duty antagonists go. It also never feels like Earth is doomed. Here it is, invaded by offworlders, with a supposedly 600:1 ratio of offworld soldiers to Earth soldiers, and yet I'm a single man with a small team and I can wreck their operations more or less with impunity. Black Ops 3 had a better plot, even if it made less sense. In a shocking twist, I've also spent a couple of hours playing this game's multiplayer! It's completely incomprehensible as a Call of Duty multiplayer outsider. It gives you a steady drip of experience points and unlocked weaponry, but I can't make heads or tails of optimizing my loadout. I jump in, shoot people, and die almost instantly if I didn't get the drop on them. There are parts of levels that look like they're where two players are supposed to take advantage of wallrunning and doing some real Matrix stuff, but it always ends up that I do the wallrun and the guy on the ground just shoots me off of the wall. There's also a cooperative Zombies in Spaceland mode that throws an 80's coat of paint on the wave based formula. If you're a Call of Duty multiplayer fan, you don't need this review to convince you to play it. The rest of us should consider it a bonus. What's disappointing to me has been the seemingly oversized backlash against this installment. The debut trailer got much more dislikes on Youtube than likes. Eurogamer has also reported that sales are down ~50% compared to last year's Black Ops 3. This is a bummer, because Infinite Warfare does more and is a more fun game for it. I get the feeling this will do one of two things; cause the next iteration to experiment less and try to get back to the popular formula, or take more risks and try to catch more players by giving us something fresh. I sincerely hope they take more risks, because Infinite Warfare might be my favorite Call of Duty.